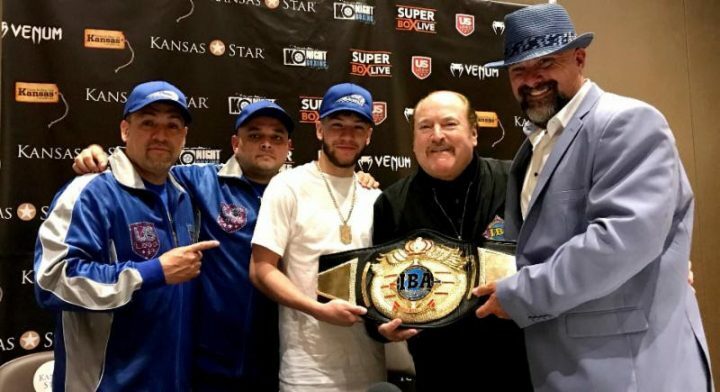 History was made this past Saturday night on the “SUPERBOX LIVE: High Stakes” pay-per-view card, when 2016 Olympic bronze medalist and local hero, Nico Hernandez, knocked out Hungarian challenger Szilveszter “The Silent Assassin” Kanalas in the opening round to capture the vacant International Boxing Association (IBA) Flyweight World Championship in only his fifth professional fight, at Kansas Star Arena in Mulvane, Kansas. Hernandez was aggressive from the opening bell, pounding Kanalas’ head and body. A Hernandez left hook to the body really hurt Kanalas, who went down from a right that followed the vicious liver shot. Kanalas beat Hall of Fame Steve Smoger’s count, and it was only a matter of time before Hernandez would end the fight. It came soon, right after another body-and-head combination put the over-matched Hungarian on the mat for the second and final time.